I am glad to welcome you on our new website of the Institute of Vascular Diseases! The IVD, founded in September 2010, is a scientific, non-profit organization and is based in Larissa, Greece. The Institute focuses on the dissemination of knowledge and the implementation of research and its objective is to promote vascular medicine not only on a scientific plane, but also at an ethical and professional level. Some of the goals, therefore, the IVD has set and is working on promoting education in research and opportunities for training on a national level, providing information and encouraging voluntarism on issues related to vascular diseases (prevention, treatment) to individuals and groups along with providing targeted information on studies in Greece and abroad, on current trends in employment, vocational training and retraining. 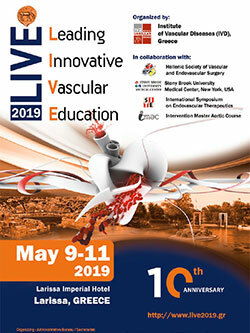 Through this website you can also be informed about all future meetings and events supported and organized by the Institute of Vascular Diseases and moreover to actively participate in a jointly effort to encourage exchange of scientific information and opinions. The Institute is newly formed and therefore this website will be gradually enriched with more functions so keep you updated! Founded in September 2010, the Institute of Vascular Diseases (IVD) is a scientific non-profit organization and holds the said name. IVD is based in Larissa, Greece.